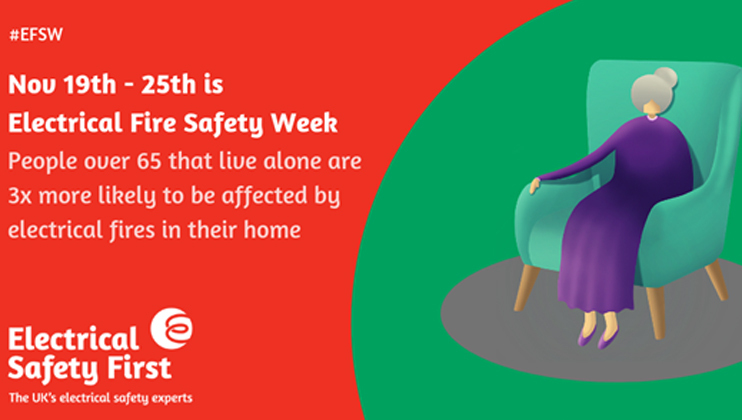 In Britain, more than one in five accidental electrical fires affect an older person living alone. Case Worker Karen Lane tells us what help is available to beneficiaries to keep safe during the winter. Last year in England, 3,849 accidental electrical fires were reported in the homes of people aged 65 and over, the equivalent of 11 a day and accounting for a quarter of all accidental electrical fires reported in dwellings in England during 2017/18. And 81% of these fires happened in homes where the occupant lived alone. As this week is Electrical Safety Week, we speak to Welfare Case Worker Karen Lane for some tips around how to keep safe at this time of year. As the temperatures drop, heating goes for longer than normal and often at higher temperatures, so it’s very important you check your boiler has been serviced recently. It’s also important to resist overloading sockets with electric blankets or heaters, and make sure you have a good supply of torch batteries for any winter power cuts. There are financial implications to this time of year as well; Christmas puts an added pressure on top of things and bills can get tight. You can find more tips on electrical safety online. If you would like to discuss how The Fire Fighters Charity may be able to help you, phone the Customer Care Team on 01256 366 581.